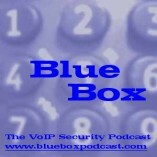 Blue Box Podcast #47 is now available for download. In this show, Jonathan and I talk about some of the recent articles and reports hyping VoIP security, recent comments from SANS about the need for better VoIP security training, moves by the Indian government to block Skype and other VoIP services and much, much more. Tons of listener comments in this show… probably the most we’ve ever had. See the show notes for all the links and info. Martin Geddes of at Telepocalypse raises an interesting point that has bothered me also, which comes back to the security of phones, and the ability for hackers to pass themselves off as legitimate organisations, such as your own bank. Today, the problem is that there is no way an inbound call can ever be secure, because any Caller ID number you receive could be faked, and many outbound call centres withhold the number anyway.Â Also, with technology like Asterisk servers and IVRs with synthesized speech, it is quite possible to build a reasonable facsimile of your bank at a very low cost. I have a card that I usually service online, and it is very rare that I ever need to call-up one of the call centres to speak to anyone. So recently when I received a call out-of-the-blue on my cellphone, I was surprised to be addressed by a synthesized voice. Knowing, as I do, that such things can cheaply be rigged-up using a regular PC (and perhaps Asterisk), I was not inclined to trust the call, or enter any of the bank security details it was asking for. I hung up on it, whereupon it called back a number of times before I drove into a GSM blackspot, which for the purposes of this discussion we can call Vermont. The repeated calls did nothing to reduce my suspicions. Like Martin Geddes, when (a couple of days later) I did finally call the number suggested in the synthesized announcement, the operator I spoke to wanted to take security details from me. I explained, as I do in those situations, that this would not be a safe thing to do, as I have just called an unfamiliar number suggested by an automated voice on an inbound call. Fortunately, at least this bank have an answer to that question: there is a telephone number written on the back of the card itself, and he suggested I call that number. Now I can be pretty sure that Iâ€™m talking to who I think. In the long run, I think banks will have to realise that they need to authenticate themselves too, and perhaps we will be able to test callers by getting them to tell us a password too.Â Â Phishing attacks can only increase in the future due to the accessibility ofÂ VoIP technology, and part of the counter attack is to teach people how to authenticate callers, before giving up vital security information. This entry was posted in VoIP Attacks in the News, VoIP Security on December 15, 2006 by Martyn Davies. At the IET Secure Mobile conference last week, Dr Philip Nobles from Cranfield University in the UK spoke about the subject of wireless LAN security.Â He showed the output of a tool running on his laptop on a 40 mile train ride into London.Â He had captured a large number of WLANs on the way, of which perhaps 60% were completely unsecured.Â In addition, you could see that many were using factory default settings, for example SSIDs (LAN identifier) of ‘netgear’.Â So all these sites can be compromised in terms of network sniffing, router hijhacking and theft of bandwidth. Dr Nobles also spoke about WEP (Wired Equivalent Privacy), the first attempt to introduce encryption to WiFi networks.Â I had known that WEP was compromised at least in an academic sense, but I was surprised that practical tools exist for breaking WEP in a very short time. “My router gave up its key in 3 minutes”, Nobles said of his own home router. 1. Use WPA encryption (WiFi Protected Access) if this is available on your router/client setup.Â If not, use WEP in preference to leaving the router ‘open’.Â Use keys (passphrases) that will not be easy to guess. 2. Most routers have an option to hide the SSID, i.e. not broadcast the name.Â This means that the clients have to know the name explicitly.Â This is is good idea to switch on, and makes you look much less interesting on the Netstumbler display. 3. Don’t use the default SSID, and it is better to use a name that will not be vulnerable to dictionary attack, and one that doesn’t hint at your physical location. 5.Â Often you can block admin logon to the router from the Internet side, which is a good idea if you don’t need to remote manage it. 6. Some routers have the facility to “lock down” access to the router by only accepting connections from specific MAC addresses.Â In my experience this can be inconvenient to manage (for example if a WiFi card is replaced, or if a friend comes to visit with his machine), but it does limit the options for attackers. 7. Similarly, with some routers you can assign IP addresses to specific MAC addresses, and use the firewall to block unknown IP clients.Â As above, this can be inconvenient to manage, but it does limit access. This entry was posted in Best Practices, Cryptography, VoIP Security on December 13, 2006 by Martyn Davies. What do you think about security via obscurity? This entry was posted in Conferences, Cryptography, VoIP Security on December 8, 2006 by Martyn Davies.